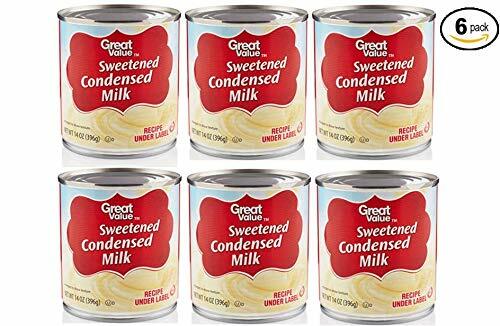 Great Value Sweetened Condensed Milk is delicious item that goes well both on its own and in a variety of cuisines. Sweetened condensed milk comes to be with the removal of water from cow milk and sugar added to produce a thick, shelf-stable product. The product may be used on desserts as a topping, like ice cream or candy, to add a more delectable taste. Sweetened Condensed Milk can also be used in puddings as a creative way to add sweetness. Even after the can is opened, you may store it for additional time in the refrigerator which will allow you to use the product multiple times if necessary. Bring sweetness into your life with Great Value Sweetened Condensed Milk. Ingredients: Milk, Sugar Instructions: Store in a cool, dry place.Refrigerate after opening. Scrumptious treat in a variety of cuisines. Shelf stable. Great Quality, Great Price, Guaranteed.